Clash of Clans by Supercell is an epic combat strategy game. This version is designed for Android mobile phones and tablets. The player's goal is to build villages, train troops and battle in multiplayer mode. With an objective to lead the clan to victory, the gamer can use all the necessary tools and weapons. Fast-paced combats: the game lets the player build his own village and protect it through thick to thin. Different weapons are put at his disposal such as Mortars, Traps and Cannons. He will be judged and ranked depending on his intelligence in battle strategy. Multiplayer mode: the player is given the freedom to call on other players' good will to create an alliance. A Player Versus Player or Clan versus Clan is possible giving the player the ability to obtain Victory Points. Clash of Clans is offering 15 unique units and several levels to enjoy. Enhancement: for this version, the interface has been improved. For example, the Chat box can be available even away from the village. In order to make it even easier to master, the Friends List has been moved to the Leaderboard menu. Tips: to fight opponents, it is preferable to build a huge fortress. 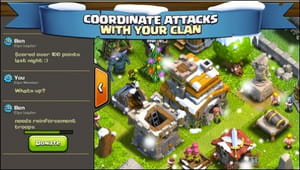 With Clash of Clans and during an attack of the enemy, the player can acquire strategic points for a relentless offensive. Players have to remember that battles take place in real time. Clash of Clans is downloadable free of charge. Latest update on November 20, 2016 at 02:35 PM.